A GREAT glove with extra WARMTH. 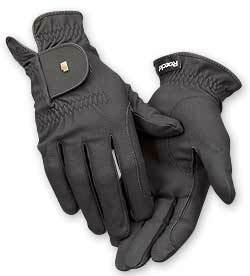 The Roeckl WINTER Chester is a lightweight and elegant close fitting glove made from Vesta synthetic leather. They won't interfere with a sensitive feel on the reins They provide an excellent grip. The materials are fast dyed and machine washable. The WINTER Chester gloves have an additional lining of Roeck-Tex, a material exculsive to Roeckl. This is an extremely durable, cellular fleece fiber, providing warmth without bulk. The hook and loop tab fastener across the back of the hand adjusts for a snug individual fit. Don't know your glove size? Use a fabric measuring tape. Measure around your hand at the widest part, excluding the thumb. The number of inches is your glove size.